The Place Surprise, Surprise! Right at the back of the NUS Law Campus along Bukit Timah Road is this hidden gem! If you just want a break from the bustling city, to escape to another ‘dimension’, then make this restaurant your next dining escapade! Blue Bali brings you to, well, Bali. The relaxing and almost-dreamy settings of the restaurant gives its patron a chance to take a breather and dine as you would while travelling in Bali. With the back of the restaurant facing the Botanic Gardens, Blue Bali enjoys the lush green surrounding combined with the old 2 storey colonial styled buildings – nostalgic. Read on to find out more about one of the best kept secrets of Singapore dining scene! The old colonial building has been done up as a Bali Villa, incorporating the key architectural values of the Balinese culture. Does this remind you of Bali? The traditional Gado Gado ($13) was surprisingly refreshing. The peanut sauce was truly what made this dish good, but we were a tad disappointed with the tofu which was alittle cold when served. This ain’t really Bali, so we decided to go over the Sumatra Beef Rendang ($25). While the taste was palatable, we ain’t sure if it is worth the high price! Was wondering if the Beef Rendang at my neighbourhood hawker centre was actually better (and cheaper)! Definitely a signature dish here, the Blue Bali Crispy Roasted Chicken ($25) was worthy of the restaurant’s namesake. It actually gives me a vibe of the Singapore local dish – Salt Roasted Chicken. Well flavoured, roasted to perfection, this chicken deserves the calories. Nuff said. To down the oily food, we decided to give this expensive Avocado Shake ($9) a try. I can only say, next! Rants It ain’t cheap. 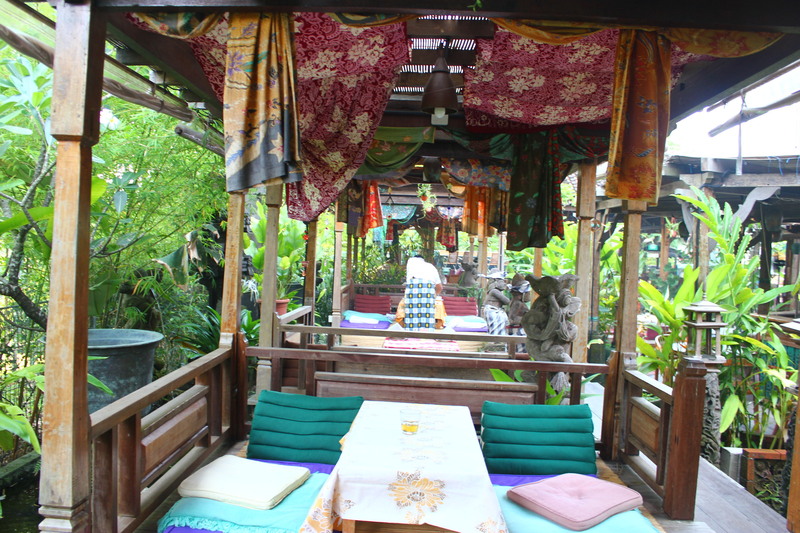 Fine dining restaurant with above average food at an authentic Balinese setting, worth it? Yay if you seek an overall experience. Nah, if you actually just want a taste of Balinese food. Will I return again? Yes. With the palate card, the 50% discount makes Blue Bali affordable. And I will never say no travelling to Bali – with a car.